Are there any Amish outside America? How many Amish are there in total? How many Amish communities are there? Which are the largest Amish communities? Do Amish live in closed colonies? Why do Amish move to new places? Where do Amish live? As of 2017, the Amish live in 31 states, three Canadian provinces, and two South American countries. States include well-known Amish places like Pennsylvania and Ohio, but also lesser-known and far-flung communities in Texas, Maine, Kentucky, New York, Florida, and many other states. In Canada, Amish have lived in Ontario since the 1800s, today home to over 5,000 Amish spread across nearly 20 locations. They have also recently started communities in Prince Edward Island and New Brunswick (as of late 2017, Amish also plan to settle in Manitoba, which will bring the province tally to four). In South America, recent communities have arisen in Argentina and Bolivia. Amish move and start new settlements fairly frequently. Check our state-by-state guide for more on Amish in each location. Are there any Old Order Amish outside the USA? As of 2017, there are settlements in three provinces in Canada. Amish once lived in Europe, but no longer do. Amish have tried to settle in Latin America on a few occasions, including in Mexico, Honduras, and Paraguay (see Sunshine and Shadow: Our Seven Years in Honduras by Joseph Stoll, for one Amishman’s account of life in Latin America). In 2016, two Amish communities were established in South America (Bolivia and Argentina). There are Beachy Amish groups outside America including in Europe and Africa. How many Amish are there in total? As of 2017, approximately 320,000. The Young Center for Anabaptist & Pietist Studies (Elizabethtown College) produces an updated estimate each year. The figure for 2017 was 318,390. See our Amish population infographic for more. Are the Amish growing? How fast? Yes. Their population is estimated to double about every 20 years, give or take a year or two. This is because they have large families, and most of their children choose to join the Amish church. How many Amish communities are there? Over 500. The 2017 estimates put the number at 532, an increase of over 50 settlements since 2014. The total typically increases by around a dozen or more new Amish communitiets each year (see “Amish Settlements Across America: 2013”, Donnemeyer and Luthy for more on Amish settlements and growth). Which are the largest communities? The biggest Amish settlements are found in Holmes County, Ohio; Lancaster County, Pennsylvania; and Elkhart and Lagrange counties in Indiana. Each of these communities is home to over 20,000 Amish. Do Amish live in closed colonies or villages? No. Amish live in rural areas, and some in small villages and towns. In many cases Amish live next door to non-Amish neighbors. Their communities are not physically “closed” to outsiders. Why do Amish move to new places? Amish migrate for different reasons. These include economic opportunities, the search for affordable farmland, overcrowding, a desire for a “slower” community, a desire to live in a community which allows more technology, and unresolved church disagreements. Amish move and begin new communities more often than you might suppose. In 2013 researchers Joseph Donnermeyer and David Luthy estimated that there is a net gain of one new Amish settlement about once every four-and-a-half weeks. They consider this a conservative estimate. “Amish Population by State (2010).” Amish Studies. Young Center for Anabaptist and Pietist Studies, Elizabethtown College, n.d. Web. Accessed 7 Mar. 2015. http://www2.etown.edu/amishstudies/Population_by_State_2014.asp. “Amish Population Profile, 2017.” Young Center for Anabaptist and Pietist Studies, Elizabethtown College. http://groups.etown.edu/amishstudies/statistics/amish-population-profile-2017. Accessed 10 Dec. 2017. Stoll, Joseph. Sunshine and Shadow: Our Seven Years in Honduras. Aylmer, Ontario: Joseph Stoll, 1996. Johnson-Weiner, Karen. New York Amish: Life in the Plain Communities of the Empire State. Ithaca : Cornell University Press, 2010. To Cite this Page: Wesner, Erik J. 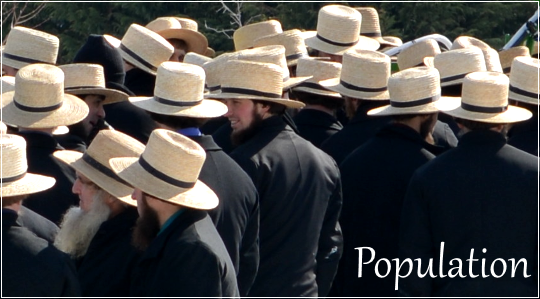 “Population.” Amish America. Erik Wesner, . 2015. Web. [Date Accessed]. <http://amishamerica.com/population/>. 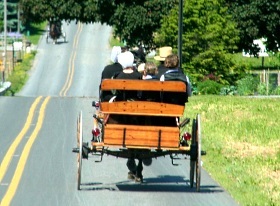 Image credits: Gathering of men- Lauren Futch; family in buggy- Ed C.
Nearest population of Amish to Arizona. I live in Arizona, and I’m interested in finding products and produce I can buy from the nearest Amish and Mennonites. Can you help me.